Research can take on many shapes and sizes. Sometimes that means 40 yards of fabric and a motorized skirt. Lauren Valley's "Body Electric" skirt is an instrument to create music based on user input. 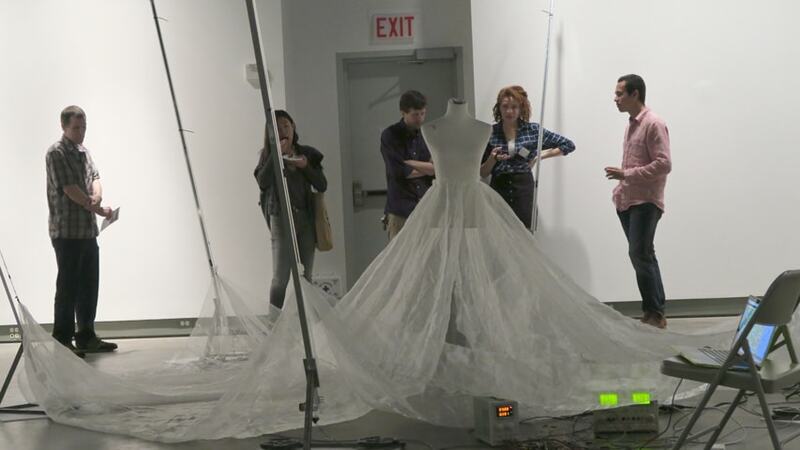 Valley, a senior in Carnegie Mellon University's School of Art, created an iPhone app that — through a series of arm movements — allows the user to cause the dress to move and create "unsettling acoustical sounds." It is the latest in a series of multimedia dresses that Valley has been working on since high school. "In essence, they weren't wearable, but sculptural," said Valley, who has a concentration in physical computing through CMU's Integrative Design, Arts and Technology (IDeATe) Network. She joined the program at its inception and has been working at the intersection of art and technology, forging her own path in courses like "Interactive Art and Computational Design." "What I've learned is how to teach myself and figure out what I wanted to do and how to do it," Valley said. The Fox Chapel, Pa., native said she knew she wanted to come to CMU as early as the fourth grade. "What I love is the interdisciplinary approach that CMU has. I can move between robotics and art and think about creative processes in different ways," Valley said. "Technology doesn't have to be functional or marketable, sometime it can be purely visual." The sound reactive robotic skirt is one of the hundreds of student projects and research subjects that will be on display at CMU's annual Meeting of the Minds, a university-wide celebration of undergraduate research. The event shows the breadth of how students explore and expand their understanding of the world around them. "What stands out at Meeting of the Minds is the diversity of projects, the range of interests, and the sheer creativity that is emblematic of Carnegie Mellon," said Stephanie Wallach, assistant vice provost for education. "It is our intellectual counterpart to Carnival — playful, historic and deeply connected to our campus and its educational mission. Everybody who attends feels uplifted by these undergraduates, their faculty mentors and their accomplishments." Paloma Sierra-Hernandez reads "Let This Letter Be," part of her Meeting of the Minds presentation. Paloma Sierra-Hernandez, a sophomore studying creative writing and drama in the Bachelor of Humanities and Arts (BHA) program, will present a bilingual poetry reading that focuses on Puerto Rican identities. Her work, "COCKTAIL: Tasting Three Different Perspectives About Puerto Rican National Identity Through Poetry," discusses how individuals perceive their national identity. One percent of the Puerto Rican population moves outside of the island annually, and today, more Puerto Ricans live outside the island than within. The work was supported with a Summer Undergraduate Research Fellowship. "I want my work to invite people to reflect on the natural mosaic that is national identity, through the questioning of different perspectives that define what we regard as our national identity," said Sierra-Hernandez, who lives near San Juan. Mark Mendell, a senior studying computer science and music technology in the Bachelor of Computer Science and Arts (BCSA) program, wanted a way to transcribe songs after Google added MIDI support to Chrome. MIDI, or musical instrument digital interface, was a protocol developed in the 1980s that allows electronic instruments and other digital tools to communicate with each other. So he created an online tool to help transcribe music more quickly. "With the vast collection of music on YouTube, as well as the real-time precision given by the MIDI format that is lacking in traditional sheet music PDFs, it also becomes easy to synchronize the note information with its actual time in the original recording, allowing for easier reference," he said. "Typically, talking to a piano has meant downloading an application, making sure it has the right audio API support, the right graphical backend, etc." Mendell said. By MIDI being embedded in a web browser, it can make it easy to share experiments and demonstrate musical techniques interactively. "If you have a MIDI piano and a song you want to transcribe, you can load the song and record notes in time with it, and then move them around to edit or delete," Mendell said. "Computer science at CMU is incredible," Mendell said. "The care for curriculum design and focus on problem-solving skills has made me feel like I can take on anything. The BCSA program has let me apply that mindset to sound projects." Visit the Meeting of the Minds website for a full schedule and a downloadable app for the event.